Your number one choice for window cleaning in Chippenham and surrounding areas. Husband and wife team Jerard and Sarah McKay are one of Wiltshire’s proud independent small business success stories. Back in 2006 Jerard, who had always wanted to run his own business, identified a gap in the local market for a professional and reliable residential and commercial “reach and wash” window cleaning service. With Sarah’s help on the admin side, he went ahead and filled it. AMac Windows was established in Chippenham. Twelve years later the couple have been joined by two employees, James Clarke and Martin Ball, and are literally awash with work. 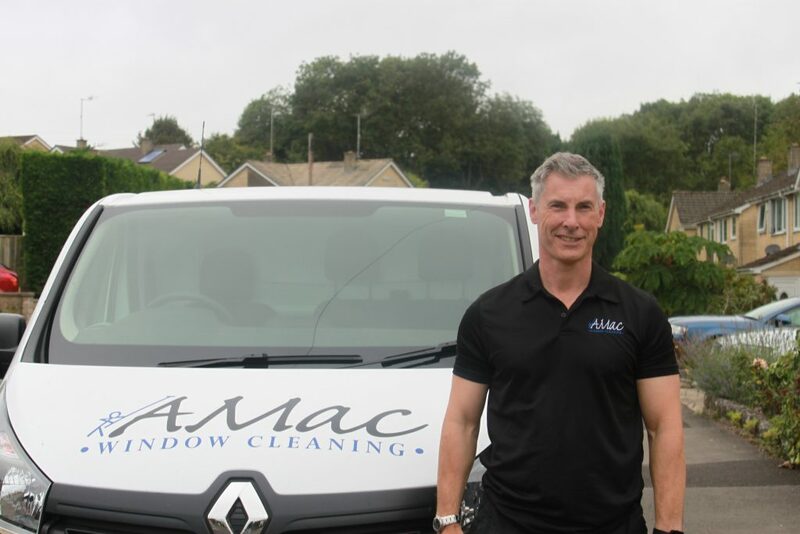 Jerard believes that the reason AMac Windows is sought after not only in Wiltshire, but across the whole of the south west, is not just because he and his team do a superb job of window cleaning, but because of their commitment to providing first class customer service. AMac is a company that cares about its clients and actively solicits feedback, always striving to improve all aspects of their service and business operation. The healthy business is continually growing and evolving. Only the best, up to date environmentally friendly “reach and wash” window cleaning technology (a system utilising extendable poles fed with purified water) has been used since the business was founded, with the health and safety of both customers and employees of paramount importance. AMac has also kept ahead of the game by maintaining a fleet of new vehicles, an informative website online and using special software to efficiently manage scheduling, customer communication and payment methods. Jerard is proud to be able to promise a next clean date that we always meet, and delivers quickly and efficiently, being as unobtrusive as possible in the process. Vans carry all the required equipment which can be quickly set up on site without causing any obstruction, because ladders are not required. Jerard and Sarah both have a strong sense of community, and have lived in Wiltshire for 50 years, so they are pleased to be able to provide a sound and useful service in the county and beyond. Some of their original customers from 12 years ago still remain loyal and regular clients of the company. AMac is accredited by the British Window Cleaning Academy, which certifies that Jerard and his team have both the professional skills and training needed to work competently and safely as window cleaners. If you’re looking for a commercial or residential window cleaner in south west England, on a contract or one-off basis, the choice is clear – contact AMac to discuss your requirements.